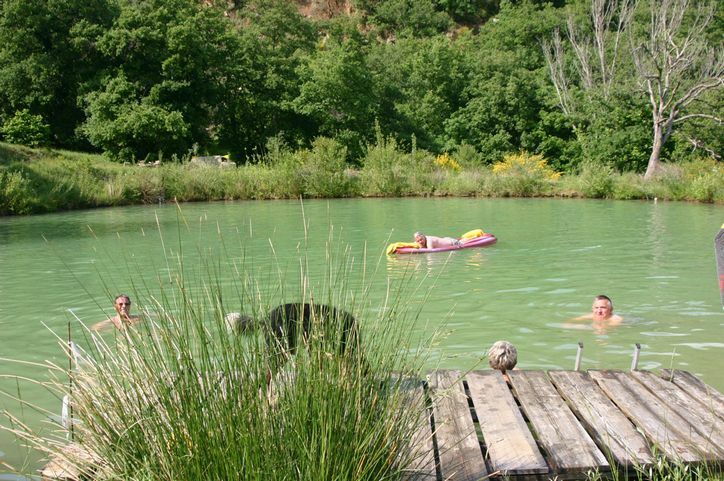 These simple but beautiful and rustic camping grounds are located at Burciano on the border of Umbria and Tuscany. Burciano is part of the municipality of Cortona, an ancient Etruscan town. 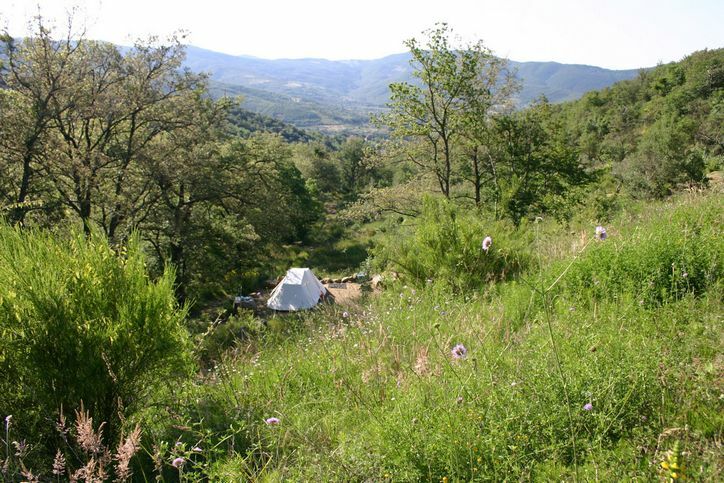 The campsite is located 550 meters behind the mountains of Cortona and offers stunning views of the Umbrian mountains. Because of the altitude and shady woods it is not as hot as in the nearby Val di Chiana. It is peaceful and secluded. Even though there is enough space on the site and there are many surrounding forests, vineyards and olive groves, we will allow no more than fifteen tents (approx 40 people) on the site to maintain the peacefulness and tranquility. The natural pool is unique (30 by 40 meters). 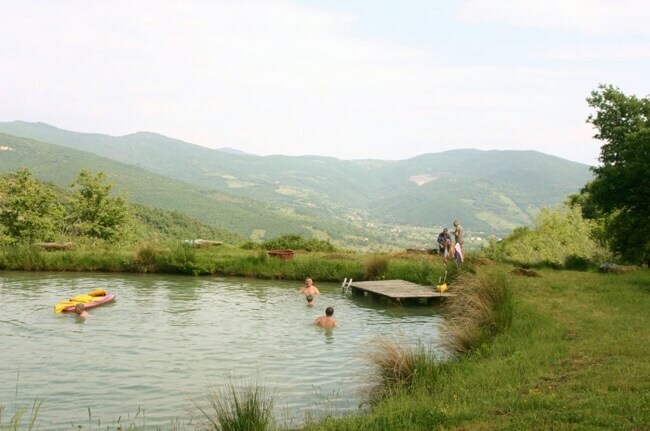 When swimming, you look out on mountains, forests and olive groves: proper panoramic swimming! You can camp with smaller tents near the natural pool. Larger tents are further away from the lake on large, spacious private places. But also smaller tents can be as remote and private as you like. You'll be disturbed by nothing, may be by some animals of the forest! You won’t hear mobiles at all here. The camp is simple, but does have the basic services. There is drinking water from our own well and there is a toilet and a shower. Hot water only when the sun shines! It is possible (by arrangement) to make a campfire. There is no electricity for refrigeration boxes, but there is a freezer for ice packs (free). On the campsite chilled beverages and organic products are available: home-baked brown bread, pure red and white wine, vegetables from the garden, olive oil, homemade jams, fruit drinks, eco eggs and lager. He started with excavating a lake, then in the most natural manner possible has created the wonderful camping plots. The plots require a lot of maintenance each year (if only as a result of the rooting and burrowing of wild boars, which are here in large numbers). The mountain road requires all year round care. He has done much to improve the road so that people without experience on such roads can safely come and go, although we hope that people won’t drive faster as a result! We keep the ecological system of the site as intact as possible; the water supply, the use of forest, waste. Respect for the environment is our priority and we expect that from our guests too. The campsite is open from July 4 to September 1. In June you also can come camping, but then the little shop/bar is still closed. Also maintenance work on the forest and the terrain might still be in progress. You can arrive on weekdays, but not before 16.00 or after 19.00 hours! If you arrive later, it quickly becomes dark and is not recommended when you use the mountain road to the campsite for the first time. Because of its location our site is not suitable for people passing through, or those with caravans, campervans or tent trailers! For those it is more convenient to find a campsite near Lake Trasimeno. Wilfredo, owner of Burciano used to be a tutor in English, French and philosophy until 1982 but has since stopped. As a child he was already busy with vegetable gardens and twenty years ago he started ecological gardening at Burciano. In Italy there was not much enthusiasm for that at the time. To earn a living he then also worked for other farmers. In 2000 he started the small scale campsite. On this site you can actually stay in the middle of nature and, if you wish so, learn about ecological gardening. Every day you can go in the vegetable garden, pick your own fruit and vegetables and ask questions about things you want to know. (Including tips for recipes). In July and August Lucia lives at camping Burciano. She organizes children's day hikes, family day walks, day hikes for girlfriends, friends, etc. Lucia has roamed in this area since 1992 and knows a lot about the history, culture and nature and knows the best and most beautiful trails and spots! The walks are tailored to the participants and the weather. Prices of the walks vary from 7 euros to 40 euros depending on transfers, entrance fees and number of participants. Throughout the year it is possible to participate in activities on site or elsewhere on the land for board and lodging. You can stay for free in a furnished caravan. Read also the directions to Burciano. For July and August reservation is obligatory. For reservations please call Lucia Tours: +39575 614369 or send an email to info@luciatours.nl. A reservation is only valid after confirmation by Lucia Tours by e-mail or phone! Call us one day in advance to let us know around what time you expect to arrive. If you get the answering machine, leave your message in English, German, French or Italian. If necessary, you’ll be called back. Arrival of new guests between 16.00h and 19.00h! Arrivals before 16:00h result in an extra day’s charge. We strongly recommend not to drive up in the dark up with a heavily loaded vehicle. So try to arrive before 19:00h. Departure by 12.00h.